Following the purchase of the 23-story Key Center, the new building owners quickly determined the need to update the common areas of the building which had grown tired since the building's completion in 2000. To stay competitive in the market for tenants, a redesign of the guest and tenant experience was initiated to entice potential tenants, give existing tenants a reason to stay, and to realign the building within the marketplace. 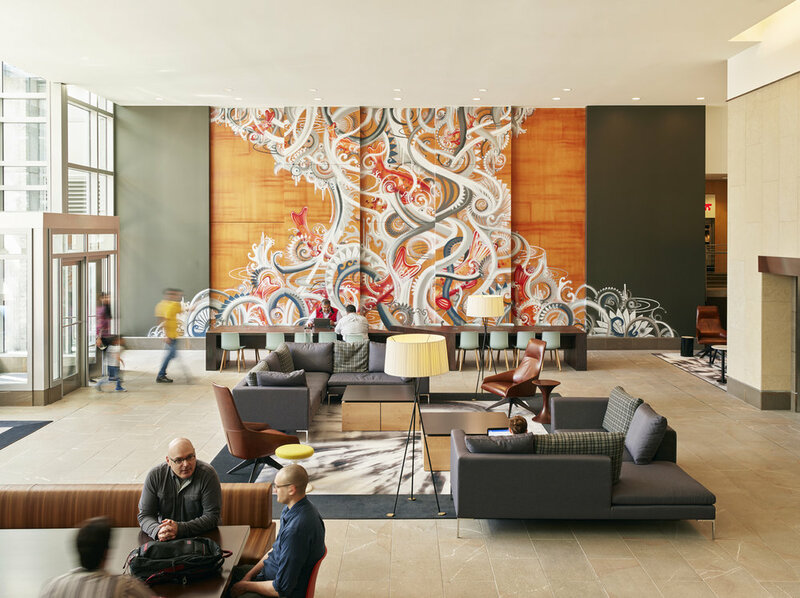 The existing lobby, a sprawling 8,100-square-foot series of contiguous spaces, lacked definition; seating was uncomfortable, and there was little reason to linger any longer than necessary. Transforming the space required re-imagining how the space could be used. A survey of building tenants revealed an interest in alternative casual meeting and work spaces. The design solution was to treat the lobby as a series of seven rooms, or stage sets-merging notions of work and hospitality-that were connected through color and seating arrangements. "It was as simple as creating spaces where people actually want to go," noted Shannon Gaffney, SkB founding partner and design principal for the project.